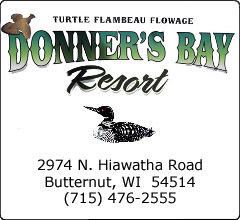 Located on the Turtle Flambeau Flowage. 7 year round cabins, full liquor bar serving lunch and dinner. Gas pump with 91 octane non-ethanol, live bait and tackle shop. 2 pontoon rentals, 3- 16ft. fishing boat rentals & 5- 14ft fishing boat rentals. 1 RV camp site available. Beach area with swim raft, paddle boat and kayaks. Basketball court and volleyball court on site. Located on the snowmobile trail and ATV trail #9. Open 7 days a week. Home of the “Little Beers”.